Lipstick has a nasty habit of migrating to teeth. And no matter how precisely you apply mascara, those stubborn lashes cling together in clumps. With holiday fêtes around the corner, we asked Guerlain National Makeup Artist Marcus Monson to solve your makeup woes. Here, Marcus demonstrates his skills on a model while dispensing tips to give you reliably beautiful results all season long. Beauty Blitz: How can you prevent bright lipstick from fading or getting on teeth? Marcus Monson: I always use a lip primer. It gives something for the lipstick to adhere to and acts as an anchor. Guerlain KissKiss Liplift is my go-to. 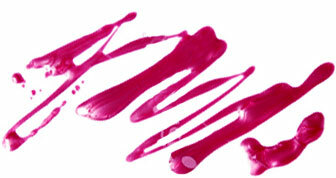 It is an instant way to ensure lip color stays in check. After applying bright lipstick, I have the client place a tissue around her index finger and place it at the inside center of lips and quickly slide it out. Any excess color will be on tissue and not on the teeth. Now you can smile for the camera and show your pearly whites and still have that picture-perfect pout. BB: How do you avoid clumped lashes while applying mascara? MM: I start with the mascara wand pushed up against the base of the lashes and wiggle out from root to tip in circular motions. While the mascara is still a bit moist, I apply the second coat, but on this coat, I hold the mascara wand vertically and push up from the base to the tip. I hold the wand at the tip for a few seconds to help set curl. By adding this extra second coat of thickness and length, I give the lashes a bit more curl. Curled lashes look much thicker. BB: How can make you under-eye concealer look natural on dark undereye circles? MM: Eye cream or eye serums are essential, but you must let them absorb into the skin before applying concealer. If the eye cream is still too moist, the concealer will quickly crease and look un-natural. It's also about the product consistency. Thick ones may offer more coverage, but they tend to crease and look less natural. I like more of a lotion concealer, which melts into the skin better. Always pat or press concealer under the eye. Don't rub. Rubbing just moves it around. After applying concealer, move on to blush and lips and come back to the undereye area to see if the concealer has started to crease. If it has, lightly pat with a fingertip, and add a touch of very fine translucent powder on an eyeshadow brush. Tap off the excess and lightly dust the undereye area. BB: How can you make powder blush look smooth, not cake-y or dusty? MM: After sweeping the brush across the product, swipe it into the tissue to remove excess pigment. When I apply, the color goes on smoother. It's easier to add build color in layers than to rub color off. BB: Sometimes bronzer makes skin look dirty, instead of sun-kissed. Any tips? MM: Bronzer is my obsession! I'm loving mosaic bronzers that offer multiple shades. Guerlain Terracotta Light in Blondes has five shades in one compact with the perfect amount of luminosity to give skin a glow. You will look like you are in love. Remember to use bronzer in a number-three formation. Start at the forehead, sweep the brush around to the cheek, then around to the jawline. Adding a little more to cheeks will boost color without looking fake or foolish. BB: What's the most photogenic way to apply shimmer? MM: Shimmer can look too shiny or sweaty on camera. My motto when using it is 'less is best.' Apply it like the letter G. Start on the forehead, work around the eyes on top of the cheekbone and down the nose. BB: Blue eyeshadows are so big right now. How can colorful shades be worn for the office? MM: Pair your blue or bold colors with your neutral shadows. Start with a basic eye look using your go-to neutrals. Next, add blue just along the upper lashline. This way, people see just a hint of tint every time you open and close your peepers. It's wearable and not wacky. BB: How do you cover a blemish without creating a big, beige lump? MM: Beige lumps are so last season. Everyone struggles with blemishes. I have burned photos of myself when it looked like I had a third eye. I don't use heavy concealers for spots. Instead, I dot lightweight concealer or foundation on just the blemish. Then I apply a skintoned pressed powder or powder foundation using an eyeshadow brush. A matte powder flattens the blemish, so it seems to seamlessly blend in to surrounding skin. Remember to carry the brush with you for touch-ups.